There are massive inequalities in global health opportunities and outcomes. Consider, for instance, that Japan has around twenty-one physicians per 10,000 people, while Malawi has only one physician for every 50,000 people. This radical inequality in medical skills and talents has, obviously, bad consequences for health; people born in Malawi will live, on average, 32 years fewer than their counterparts born in Japan. These facts are troubling in themselves. They become even more troubling, though, when we start asking why nations like Malawi have so few physicians. The answer, it seems, is not that the citizens of developing countries have no interest in becoming physicians, or a lack of opportunity for medical training; in many cases, developing societies spend a great deal of money training new physicians, and spots in medical school are avidly sought. The reason for the low numbers of physicians, instead, has much to do with what medical training provides: namely, the opportunity to leave the developing society, and enter into a more developed one. Developed societies such as the United States and the United Kingdom have made immigration comparatively easy for those with scarce medical skills. The result is that those who are trained abroad will often choose to take their newly-minted skills to the developed world, leaving their impoverished compatriots behind. The result is a continued shortage of medical personnel in sub-Saharan Africa. No matter how much a developing country puts into medical education, it is unlikely to thereby obtain an adequate stock of medical personnel. In 2000, for example, Ghana trained 250 new nurses – and lost 500 nurses to emigration. In 2001, Zimbabwe graduated 40 pharmacists – and lost 60. In 2002 alone, Malawi lost 75 nurses to the United Kingdom – a cohort that represented 12% of all the nurses resident in Malawi. This phenomenon of high levels of migration of talented (and, often, expensively trained) people from developing nations to developed ones, is often referred to as the “brain drain.” The phenomenon is, or should be, troubling to those of us who care about global justice. The phenomenon seems poised to perpetuate the inequality in life-chances between the developing and developed societies. The absent talent of the emigrant undermines both the life-chances of present citizens of the developing society – a society with fewer doctors, after all, is a society in which more people will die avoidable deaths – and the chances for that society to develop flourishing institutions for future citizens. The phenomenon also seems almost ludicrously unfair: the wealthy citizens of the United States, already well-equipped with medical services, are increasing their stock of medical personnel by depriving the most needy global citizens of medical practitioners. It is tempting to conclude, as a recent headline in the New York Times had it, that America is stealing the world’s doctors. Like any complex phenomenon, it is likely that different people will have different responsibilities to reduce injustices associated with the problems presented by brain drain. Agents from affluent developed countries — such as recruiting agents for healthcare organizations in the United States – may well have one set of important responsibilities. And those in poor developing countries might have another. In efforts to address these problems, might governments of poor developing countries defensibly introduce compulsory service programs? Would they be justified in requiring high skilled migrants who have left the country to pay taxes for a short period (e.g. three years) after leaving their countries of origin? Two powerful lines of argument pull in opposite directions. On the one hand, the dire needs of compatriots, the investment of public resources in training highly skilled citizens who leave, governments’ responsibilities to provide services that would meet needs, the benefits the migrant has received while living in her country of origin and her duties to reciprocate, suggests short periods of compulsory service or taxation may be justified. On the other hand proposals for compulsory service or taxation might be construed as both unfair and illiberal. They might be thought unfair because they place a disproportionate share of the burden of global justice on talented and educated residents of developing societies; and illiberal, because they rest upon an illegitimate vision of what the state is entitled to claim as its own. Which, if either, of these lines of argument is more compelling? 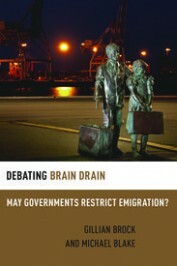 If neither, are we faced with only tragic choices in trying to confront the problems presented by brain drain? Featured Image: Globe Earth World Globalization Planet Global by geralt. Public Domain via Pixabay. Gillian Brock is Professor of Philosophy at the University of Auckland in New Zealand. Her recent and current research focuses on global justice and related fields. Her most recent works with Oxford University Press include Global Justice: A Cosmopolitan Account (2009), Cosmopolitanism versus Non-Cosmopolitanism (2013), and Debating Brain Drain: May Governments Restrict Emigration (2015). Michael Blake is Professor of Philosophy and Public Affairs at the University of Washington. He writes about international distributive justice and the ethics of immigration. He is the author of Justice and Foreign Policy (OUP, 2013) and Debating Brain Drain: May Governments Restrict Emigration (OUP, 2015). “Brain drain” and “compulsory service programs?” they seem both to hit the same people, i.e. those from poor countries. An alternative proposal instead of punishing the poor countries could be that wealthy countries sign-up on programs that allow for those highly educated “brain-drains” to work part of the year in their native country by sponsoring them. As such the wealthy countries will be directly investing in the poor country with the people that probably have the strongest incentive to see their land prosper. At the same time the “brain drainers” in their own land will become role models that are visible and others might follow on obtaining higher education.